I’ve always been an avid reader, everything from cereal boxes to encyclopedias, and I had a library card from a very young age. But it wasn’t until I started reading a Danielle Steele novel that I got serious about writing one of my own. Let’s blame an editing oversight, but one early page of Steele’s novel described the heroine’s eyes as blue. A few pages later, they’d mysteriously become green. In fury, I tossed the book aside, certain I could do better! Little did I realize how hard that would be. First off, I’m a Cradle Catholic and was discouraged from telling tall tales, even if they made for a good story. Second, I was trained as a journalist. Someone who quoted sources, dug out facts, and prided herself on being fair and accurate. But the lure of a blank screen and an idea that wouldn’t die kept me plodding forward. Despite false starts, dead ends, frustration with characters who wanted to go their own way, and even computer crashes, eventually I was able to tie up the loose strings and type The End. I could have left it as it was, unpublished. The novelty of seeing my name in print had dimmed, and I didn’t need to prove to anybody but me that I could write an entire novel. Yet friends and family encouraged me to send it out into the world. To let others read it, and I hope, enjoy it. Recently, the postman arrived with several heavy boxes in tow. “You taking up publishing?” he asked with a grin. “Oh my golly, those are my books!” I hollered. Trust me, there’s not a better feeling in the world than holding in your hands the published copy of a book you’ve labored over, knowing it’s a story only you could tell. So have I found any editing errors in the printed version? You bet, but I’m not saying where they are! P.S. Shameless begging begins now. 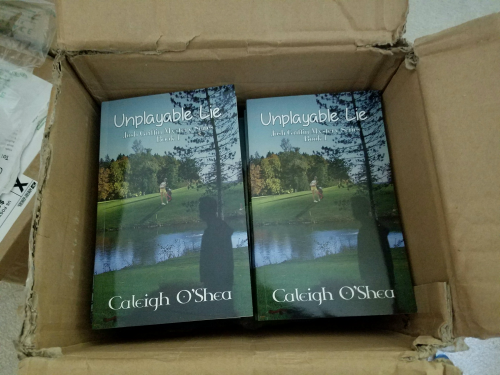 My novel, Unplayable Lie, won’t come out until Oct. 15, but it’s available for pre-order here. This entry was posted in Writing and tagged delivery of books, Unplayable Lie, writer's journey, writing a novel. Bookmark the permalink. This is amazing!! Oh, Debbie, there really is no other feeling like it. Congratulations. I can’t wait to read it!! I know you know how amazing it feels, Lucy! Thanks for the good wishes, and I’m eager for your next book, too. You did?? Seriously?? Golly, that’s splendid — you’re such a GOOD friend, Lucy. Thank you!! Of course I did!! I’ve been waiting for it. Now I have to wait a little longer but I have my own copy ear-marked!! It’s my pleasure, Debbie. You must let me know if you like it … or if you don’t. I’ll never improve without feedback! I shall indeed. I’m sure I will love it but will be pleased to share any thoughts about anything that could be tightened up. Don’t worry about all that now, though, just enjoy that wonderful feeling of having your book in your hands! ;) Thanks again, my friend! How wonderful! I remember you telling me way, way back when that the background of your blog page was related to the novel, but that I’d have to wait to see what the relationship is. Now, I see! Congrats — it must be a wonderful feeling. Who cares about an editing error here or there — better to have the book with one or two errors than not to have the book at all! I’d forgotten about the background, Linda — thanks for reminding me. You know, I’m black and blue from pinching myself! As soon as these copies arrived, I snagged one and read it cover to cover. I probably ought to hold a contest to see who can find the most editing errors, but nope, not going there. It’s finished and now I’ve got to come up with Book Two. Which, I hope, won’t take as long to write as this first one did! Thanks for the congrats, Morgan — I know you know the wonderful feeling of finding an entire box full of your books, your words! Sorry, I don’t do Facebook. I’m on Goodreads, Twitter, etc., but I just can’t do everything. I’m *supposed* to be promoting — mostly, I’m just kind of finding my way in the dark. Lots of trial and error. It’s a process, isn’t it? Oh, my, how wonderful! I’ll email you, Morgan — thank you!! I ordered and I can’t wait! I’m so excited for you! The plot is right up my alley. And since I devour books at a couple a week, I am always looking for another good book to read and share. Currently,working my way through the Agatha Raisin’s books…I’m desperate. You did it!! Isn’t that something!! Already?? Oh, my, I’m humbled … and oh so grateful. Thank you, Katybeth, for being such a good and supportive friend!! Now how are you progressing on the one you’ve been meaning to write??? OMG Debbie, you must have gone bonkers when you opened that box and saw your book IN PRINT!!!! I am soooooooooooooooo happy for you, my friend. I bet it feels great to see all your dedication and hard work come to fruition in the birth of this book! I have a blogging friend who published a book several years ago and he too found editing errors after it went to print. Again, CONGRATULATIONS to you, Debbie! And ooooo…October is the perfect launch month for your book because it’s right in time for being a Christmas gift this year! Bless you, Ron! Yes, I admit to a few tears of joy when I actually held a copy in my hands. It’s waaay different than looking at a computer screen — and that’s probably why the editing errors slipped in. My editor and I had been going back and forth for so long trying to get it perfect that it’s no wonder a few gremlins sneaked in! Thanks for your take on the October publication date — I really hadn’t even thought of Christmas. Well, who can blame me, when it’s 90 degrees outside?!? Thanks so much, FF. My emotions are all over the place — excited, nervous, terrified. I hope at least a few people will read — and enjoy — my story, and that they’ll be eager for the next installment. I truly appreciate your support, my friend! Congratulations Debbie. Wishing you all the best. Thank you, John. Now tell me, does the feeling of excitement over seeing your words in print ever go away?? I figured that you’d know the answer to this one, seeing as how you’ve got several books already in print!! Yikes! I don’t think I need anybody pointing out the typos. I’ve already found them, and I cringe when I think about them! Congratulations, Debbie! Over and over and over! Wishing you much success with the book. Thanks so much, Barb. It means more than you can know to have so many supportive, encouraging friends! Yay!! I’m so happy for you, Debbie. This is amazing! Thank you, Poetess. It *is* amazing, and every time it comes to mind (dozens of times over the course of a day! ), I get all teary-eyed again, ha! What an amazing accomplishment! Congratulations on your new baby! A published author! How amazingly wonderful! Kudos to you for pursuing your dream. I can only imagine how you must feel. And to think I knew you when, lol. Here’s to great success for you, my dear, and to many more published books! What joy! Monica, thank you so much! Is there a journalist in the world who hasn’t thought about writing a book? Perhaps we never tire of seeing our names in print, of knowing our words have touched/encouraged/provoked others. I’ve read the stories of many debut authors — all are different, but the common thread is persistence and belief in their story. I so appreciate your sharing in my joy!! What a nice thing to say, Virginia — thank you for saying it! Yes, most people don’t realize how much different it is to write as a journalist, then to switch to fiction. Perhaps it would’ve been easier to write a fact-based story first, ha! Charlotte, how kind of you to stop by and offer your congratulations — I so appreciate it. As another creative person, I know you know how much dedication something like this takes. Best wishes for your own success — follow your dreams!! Congratulations Debbie. This is so exciting. I know how much blood, sweat and tears have gone into this endeavor. I look forward to reading it. Thanks, Pat. I hope it’s half as good as yours! !